A programme of artists commissions has been developed by the Confluence partnership, creating opportunities for the people of Haverfordwest and Pembrokeshire to engage with artists practicing locally and throughout the UK. Each of the commissions has ranged in scope and scale from the small and medium sized through to one larger scale capital commission. A micro-strand of the commissioning programme has also been developed as a test bed for new ideas. Conventional thinking assumes a town has or should have a town centre, but what is a town centre and how is this defined? Engaging with a range of people and stakeholders in the town, the artist Janetka Platun evolved Searching for the Centre between September and February 2017, providing an opportunity to investigate the psycho-geographies of Haverfordwest and create a multiple edition artwork capturing and communicating her findings. In the last week of May 2017, Janetka returned to Haverfordwest for a week long visit to launch the artist booklet Searching for the Centre, created during her commission earlier in the year. In both English and Welsh versions the booklet is available from the Lab and as downloadable version here here. The lauch of the artwork provided an opprtunity for Janetka to work with key decision makers and the wider community to explore her findings in a series of creative workshops Doing things differently. 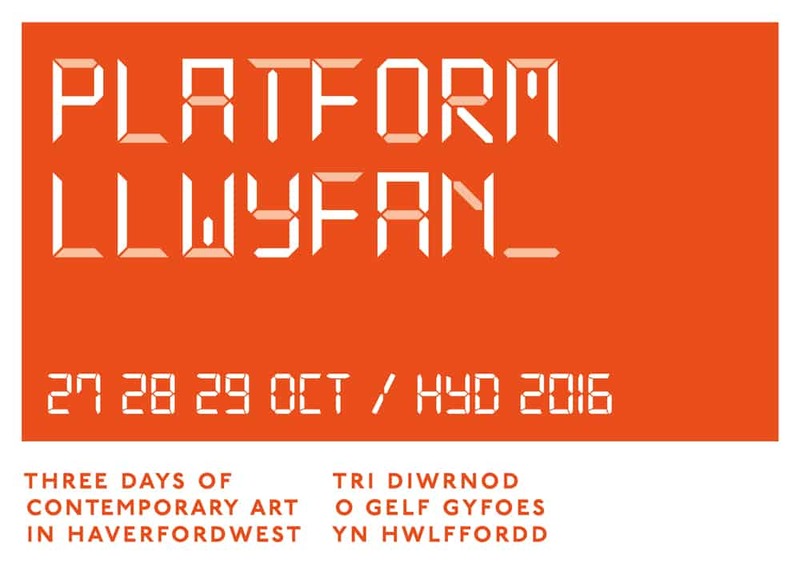 PLATFORM presented Haverfordwest as a stage for a programme of new commissions and existing artworks by artists living in and around Pembrokeshire. The programme reflected the diversity and depth of contemporary arts practice in the region, and included artists’ film, installation and performance that together created a body of work that was in turn exciting, thought- provoking and inspiring. 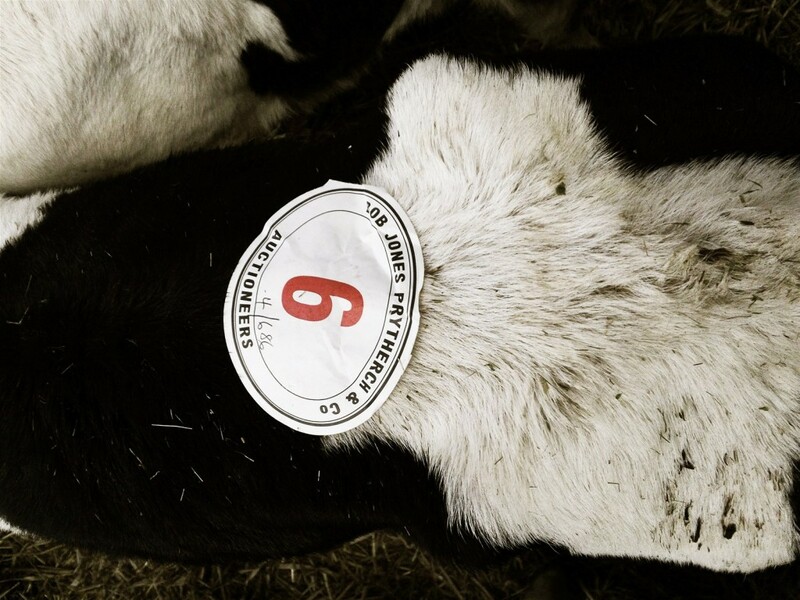 Through Spring/Summer 2016 BAFTA award-winning artist film-maker Karen Ingham created Pembrokeshire Drover: an artist film installation, which was shown as part of Haverfordwest Festival Week in July 2016. An accompanying artist’s book, featuring research stills and revealing the context and concepts behind the work is available to view and download here. 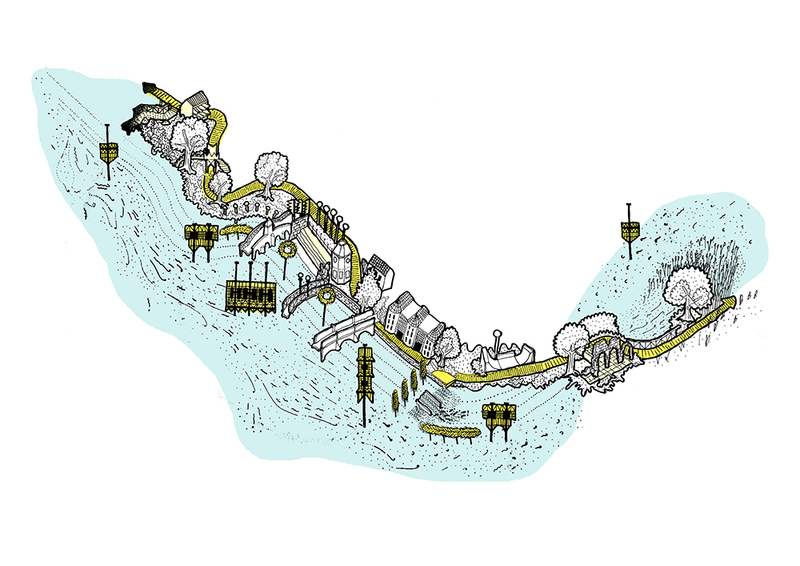 Exploring the joint history and mythology of the Western Cleddau river, flowing through Haverfordwest, Serena Korda worked with local musicians, and producer Andy Wheddon, to produce a rave track for Haverfordwest. Presented by bloc in association with the Lab, an amazingly diverse group of 35 people from the fields of art, technology and the outdoors, came together for Wales’s first ever Wild Hack on Saturday 24th October 2015. 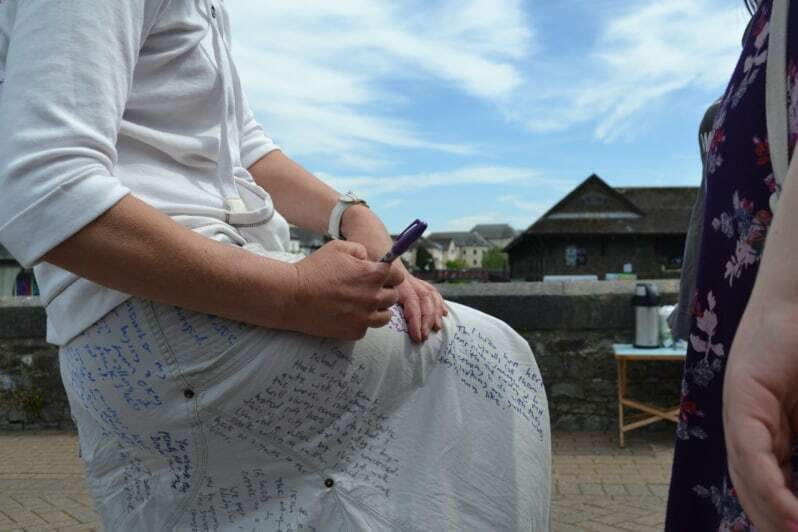 In the run up to the project launch in May 2015, artists Davis & Jones, equipped with a portable cafe and some marker pens, approached people out and about in Haverfordwest inviting them to chat about their thoughts and memories of the town. Young and old, holidaymakers, people on their own, people in groups, shoppers, workers, skaters, families, friends, people with dogs, buskers, people with family ties, people living in town and people living nearby all took time to stop and talk. The thoughts, memories, feelings, hopes and fears which people generously shared, were put together to create the Random Story Generator Haverfordwest, which can be viewed here. 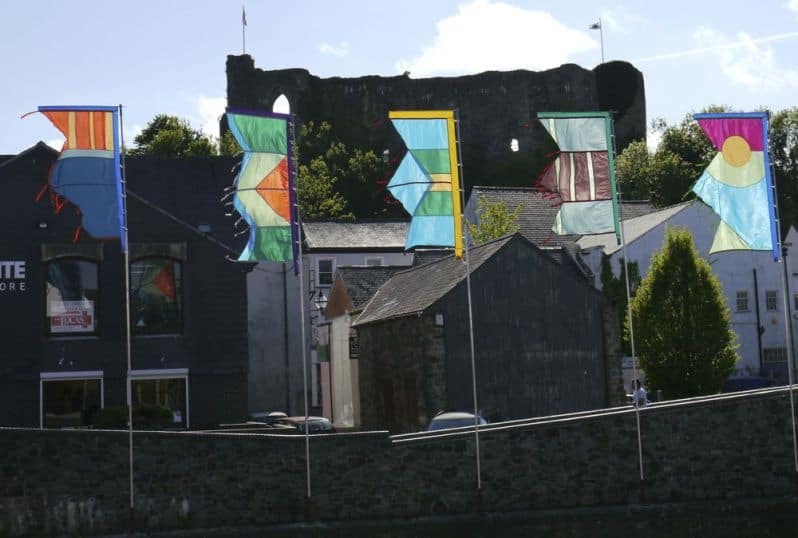 During March 2015, A&E Adventures an inspirational local creative company, based in Talbenny near Little Haven, ran a series of design workshops with seven Year 5 and 6 classes from Haverfordwest primary schools to inspire the process for a set of festival flags to launch the Confluence project. Established at the start of 2016, Ideas Lab provides a test-bed for arts and regeneration projects in Haverfordwest. 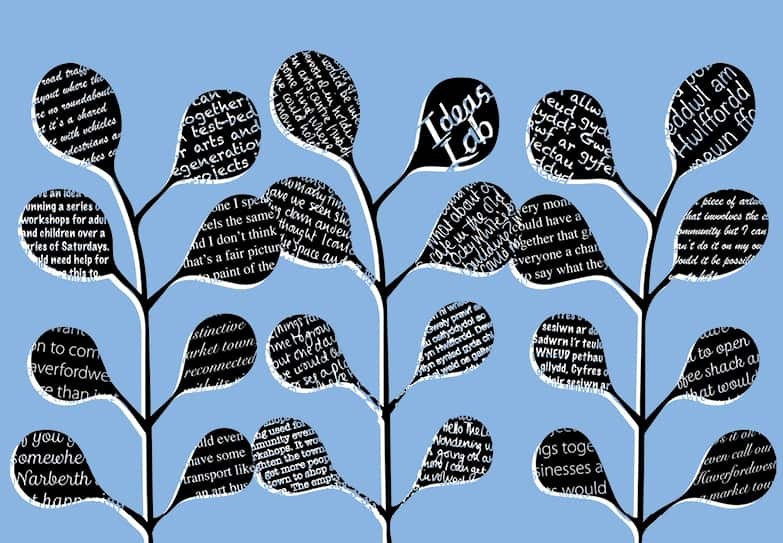 Through a monthly drop-in session individuals and organisations are invited to bring along the seed of an idea and see if by working together we can make it happen. 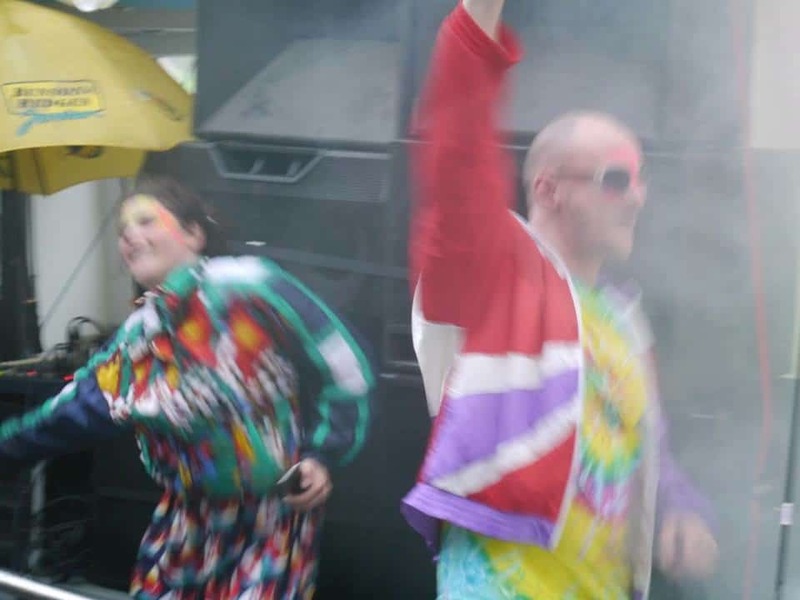 Chris Evans, bloc, Davis & Jones, Guy Norman, Heidi Baker.